You may be wondering that these flag are installed somewhere near soccer city in South Africa !!!! But No, these are the scenes from Karachi where football craze is at its peak. 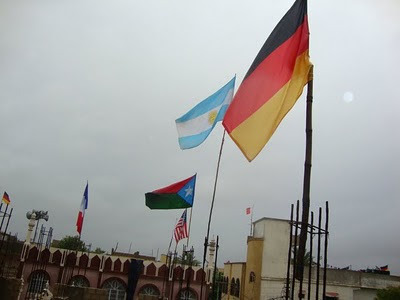 In many of Karachi Afro-Pak localities such as Lyari, Malir and Gadap Town, these are the common scenes where Football participating team flags are hosted on the roof top of the houses, kids are wearing t shirts with flags all across the town, painted flags on the wall and large screens are installed across the locality where the football match is broad casted live for Free . Every discussion starts with football and ends with football. Truly football loving communities, passionate and real aficionado !!!! As a South African i really appreciate this.